Who isn't excited to see our amazing Filipino-blooded fighters enter the One FC ring and triumph over their opponents? I don't know about you but I'm more than thrilled to see who gets to emerge as victorious on the big fight night when we witness several fighters try to overcome each others strength, stamina and fury. It will be a spectacular night filled with raw guts empowered by cheers from the audience. I am ecstatic to see international MMA superstar Brandon Vera and world-renowned female boxer turned MMA fighter Ana Julaton as they battle it out against equally formidable fighters. These two are all geared up for ONE FC: WARRIOR’S WAY this December 5, 2014, and I'm sure all roads will lead to SM MOA Arena in Pasay City as people flock towards the much awaited MMA bouts. Coach Angelo Reyes and Ricky Lundell coached both Vera and Julaton in preparation for their fights. The two had joint training sessions at MP Training Club, located at Los Angeles, California. 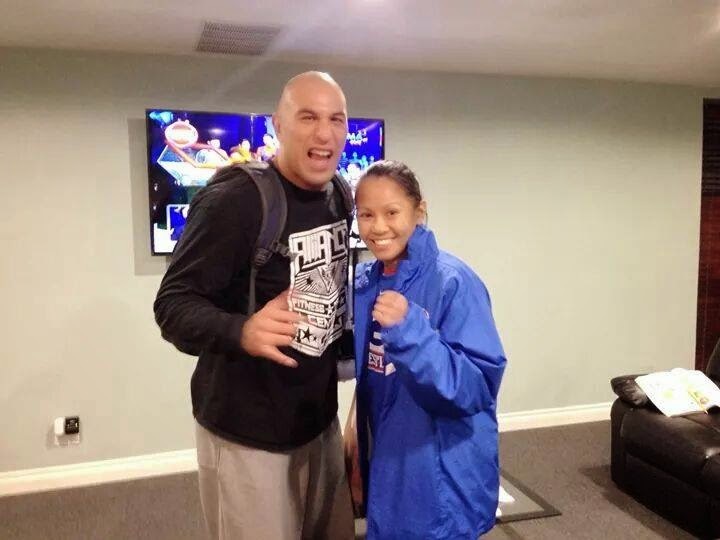 Brandon Vera made the trip to MP Training Club in Los Angeles, California to train alongside Ana Julaton and her long-time coach Angelo Reyes. Vera worked several rounds of boxing pad work with Reyes while doing several rounds of training with Julaton’s training partners. Reyes, who has more than a decade of experience as a boxing trainer was impressed with the skills that both of them displayed. He stated, "Ana Julaton is the Best Boxer in MMA today. To juggle two sports simultaneously is amazing to witness from such a humble and hardworking person. 2015 will be a Big Year for Ana as she has plans to win another World Boxing Title and also Challenge for the First Ever ONE FC female Belt”. Brandon Vera and Ana Julaton being trained by Coach Angelo Reyes at MP Training Club, located at Los Angeles, California. According to Coach Reyes “Brandon is truly a gifted fighter. Right away I felt the power he has in his hands and with more Boxing training plus his superior Muay Thai skills and his excellent JiuJitsu, Brandon will become the ONE FC Heavyweight Champion very soon!" Julaton and Vera are now set to travel to Manila later this week in anticipation of their upcoming bouts. Julaton will face Walaa Abbas in her return to compete in Manila for the second time, while Brandon Vera will make his ONE FC debut against URCC Champion Igor Subora. The duo is now set to represent the Philippines and show the power of the true Filipino warrior spirit!